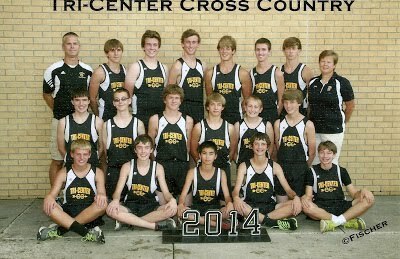 Congratulations to the Tri-Center Boys Cross Country team! The Boys finished 2nd out of 21 teams last night at Panorama and will compete at the state meet in Fort Dodge on November 1. Christopher Jarrett placed 6th, Dion Coffey 13th, Matthew Wehrli 25th, Zach Denning 38th, Marcus Mumm 41st, Jake Wohlers 55th, and Carter Dollen 60th! There were 157 runners in the race. The Girls team placed 14th. Courtney Chapman finished 18th, Olivia Russo 65th, Sidney Porter 78th, Ally Cunningham 99th, Sydney McKee 112th, Anita Kline 113th, and Christine Hess 118th. Great job Tri-Center runners! State t-shirt order forms are in each of the offices. Orders are due today, October 24th at 3:30 to Mr. or Mrs. Jarrett.